SBI and Nature Publishing Group is pleased to announce to launch npj Systems Biology and Applications, an online open access journal dedicated to publishing high quality research. The journal will begin accepting submissions in November 2014 and publish its first articles on nature.com in Q1 2015. (...more in English) (in Japanese). SBI to work with Monash IVF, a premier clinical and research institute in Australia, on systems biology of reproductive medicine to improve clinical success. SBI, through recently established SBI Australia, Monash IVF, and Australian Regenerative Medicine Institute (ARMI) signed MoU for a series of joint research spanning from basic to clinical research to bring systems biology into infertility issue. Monash university (Melbourne, Australia) and SBI have signed an agreement to establish SBI Australia at the Australian Regenerative Medicine Institute (ARMI). Kitano will present "Systems Drug Design and Garuda Platform" in OIST Seminar on Oct 10th. U.S. Food and Drug Administration (FDA) and SBI have signed the Memorandum of Understanding for collaborations on drug safety and systems biology research. SBI releases the iPathways 1.2 , to explore the biological pathways for iPod/iPad device. Luxembourg Centre for Systems Biomedicine (LCSB) and SBI are conjointly working on a deeper understanding of the complex system of Parkinson's disease. “BioComplexity Symposium : Systems Biology Approach to Systems Drug Discovery and Systems Medicine” to be held on 14 February 2011 at Auditorium, NUHS Tower Block, Singapore. 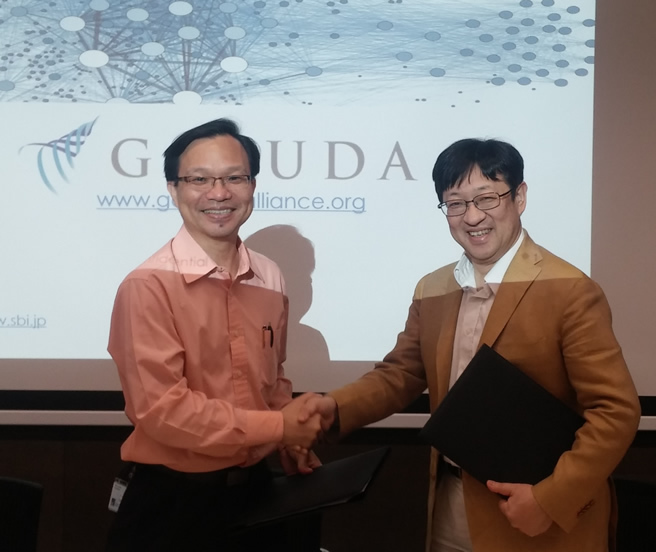 It is jointly organized by National University of Singapore (NUS), Agency of Science, Technology and Research (A*STAR) and SBI, represented by Professor Fu-Xin-Yuan, Professor Sir David Lane and Professor Hiroaki Kitano respectively, as co-organizers of the event. 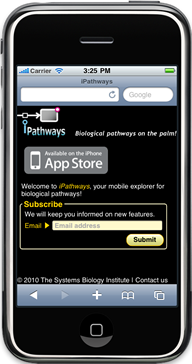 SBI releases the iPathways, to explore the biological pathways from your plam, from App Store for iPod/iPad device. SBI was awarded the Good Design Frontier Design Award and the Good Design Special Award of Judging Committee Chairman. celebrities. Previous speakers for MH-FT club dinner were President Nicola Sarkozy, France; Jeff Bewkes, CEO, Time Warner; Sir Neville Isdell, Chairman and CEO, Coca-Cola; and Prince Albert de Monaco..
SBI is nominated for Frontier Design Award category. SBI today announced that it won a three-year grant from the Canon Foundation on coral reef systems biology. The project is a joint project with Prof. Monica Medina (UC Merced) and Roberto Iglesias Prieto (Unidad Académica Puerto Morelos), and seek to investigate robustness trade-offs in coral-symbiont systems for better protection and recovery of coral reefs against climate change. SBI team supported Indian OSDD Project in creating a large-scale comprehensive map of metabolic network of TB. During the recent Connect to Decode conference held in New Delhi, a team of over 150 Indian students and researchers and SBI team (Dr. Samik Ghosh and Ms. Yukiko Matsuoka) joined forces to create the first comprehensive map of TB metabolic network using CellDesigner. The map will be up-loaded to Payao community curation system for further annotations. Dr. Samir Brahmachari (CSIR, Director General) and Dr. Hiroaki Kitano (SBI, President) shake hands to celebrate completion of the draft map. 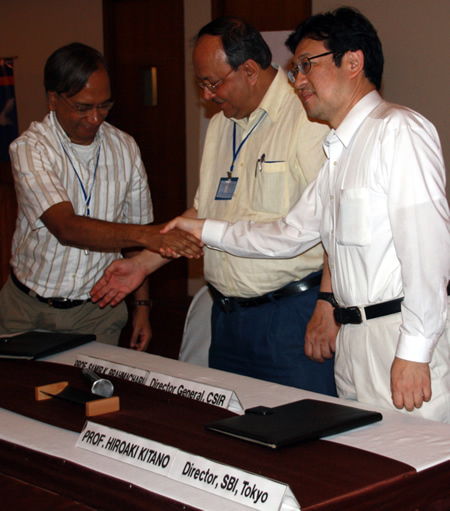 (from left: Dr. Anshu Bhardwaj, Dr. Samir Bramachari, Dr. Hiroaki Kitano, Dr. samik Ghosh). 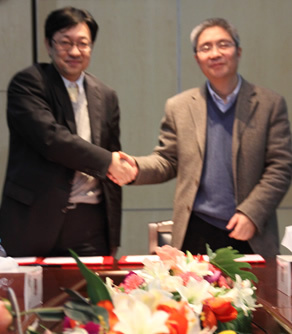 The Systems Biology Institute (SBI) and Key Laboratory of Systems Biology, Shanghai Institute for Biological Sciences of Chinese Academy of Science (LSB/SIBS/CAS) today signed MOU on comprehensive joint research, education, and promotion of systems biology. Both parties agree to organize a series of workshops and plan joint research in systems biology. Key Laboratory of Systems Biology, Shanghai Institute for Biological Sciences of Chinese Academy of Science and SBI have jointly organized the First China-Japan Workshop on Systems Biology at Shanghai Institute for Biological Sciences on 14 March 2010, participated in by 12 speakers from both side and discussed systems biology and its application to diabetes, cancer, drug discovery, as well as information infrastructure. A two-day workshop will end with a tutorial session on CellDesigner and Payao on 15 March 2010. SBML paper [PMID: 12611808] exceeded 500 citations in the ISI Web of Knowledge. Launch of the first standard graphical notation for biology. SBI donated over 4,000 copies of journals and books on molecular biology to a newly established private research center, the Molecular Biology Center in Cameroon led by Dr. Celine Nkenfou Nguefeu. This is a part of effort by SBI to support systems biology and biological science globally. CSRI and SBI signed the MOU to seek for collaborative initiatives to promote systems biology and its medical and environmental applications in India and Japan. The first Future Challegne for Systems Biology workshop was held 4-6 February, 2008 in Tokyo. 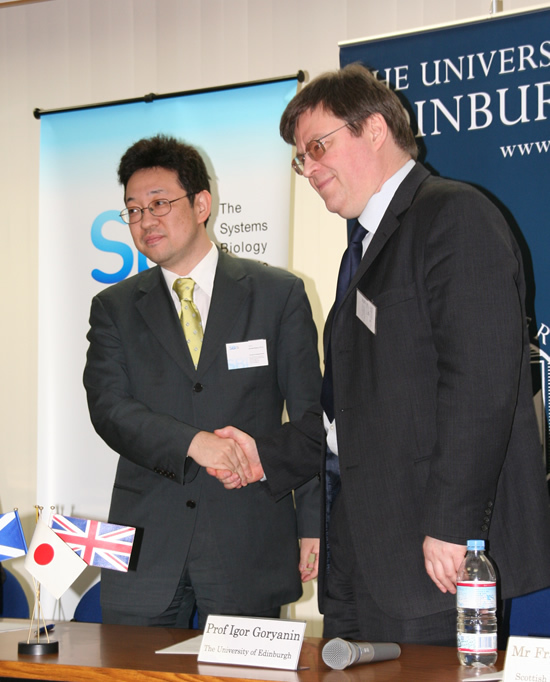 The workshop was organized by the BBSRC(Biotechnology and Biological Sciences Research Council, UK) and JST (Japan Science and Technology Agency). About 100 researchers were participated in the three-day event. The Tokyo Declaration was adopted on the last day of the sessions. 1. "Towards a theory of biological robustness"
8. "A comprehensive pathway map of epidermal growth factor receptor signaling"
10. "A comprehensive map of the toll-like receptor signaling network"
The first Systems Biology Graphical Notation workshop was held at AIST CBRC, Tokyo on February 11th and 12th, 2006.